Note: This post was edited in April 2018 to remove the reference to Feedjit which has now closed. Visitor tracking widgets are a useful way to display visitor statistics on the front end of your site. With a wide range of visitor tracking widgets available that you could embed into blogs and websites it can be confusing deciding which one(s) to add! This post provides an overview of the more popular visitor tracking widgets used on class blogs, student blogs, and personal educator blogs. We’ve inserted each widget into this post so you can see how they work. You normally add visitor tracking widgets to sidebars (rather than posts) and we explain how this is done later in this post. Why Use Visitor Tracking Widgets? First, let’s talk about why you might want to add visitor tracking widgets. Unless you find ways of displaying visitor numbers and their geographical locations, your students won’t appreciate that they’re publishing posts for a global audience. Knowing you’re writing for a global audience is incredibly motivating for students. Realizing people from other countries are reading what they’ve written increases students’ interest, excitement and motivation to blog. These widgets also provide built-in geography lessons — most students constantly check for new visitors and enjoy finding out more about the countries where their visitors are from. Some educators also add tracking widgets to their personal blogs as a way of displaying their blog’s popularity and readership to themselves and their visitors. Visitor tracking widgets display visitor statistics in a range of different ways which is why it isn’t uncommon to see several different types of visitor tracking widgets on class blogs. ClustrMaps is a thumbnail hit counter map widget that shows the geographical location of all visitors to your blog. The number of visitors from a location is indicated by the relative size of the dot. Clicking the ClustrMaps thumbnail takes you to a large world map so you can examine your traffic sources more closely. 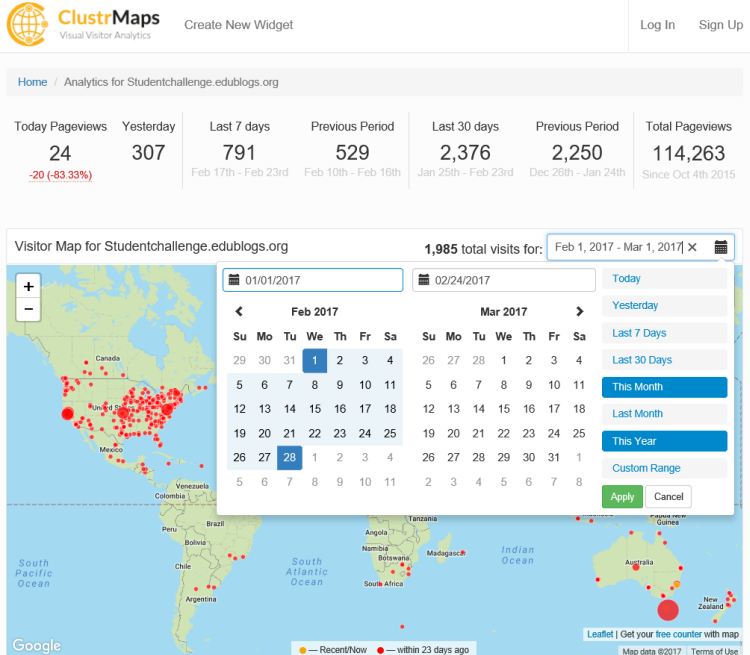 The ClustrMaps widget used to display your yearly stats and archived the yearly data on 31 December. It now displays your monthly data only. To view previous monthly data you need to click on the ClustrMaps thumbnail, then select “This Year”. Flag Counter widget shows the total number of visitors from each country next to the country’s flag. Whenever someone from a new country visits your site, a new flag will be added to your counter. Clicking on the flag counter takes you to your flag counter page which provides more detailed charts and information about your visitors. Revolver Map displays all visitor locations and recent hits live and in realtime on a revolving globe of the Earth. Clicking on the widget opens the Revolver map live statistics page. All visitor tracking widgets are added by pasting their embed code into a text widget in your sidebar. 1. Copy the embed code for the widget you want to add. ClustrMaps: This is the only visitor tracking widget on our list that requires you to sign up for an account to access the code. You’ll find detailed step by step instructions on how to set up ClustrMaps and access their code here. Flag Counter: Click on Get Your Flag Counter. Once you’ve customized your counter you can then copy the code for websites (you can click on skip if you don’t want to sign up using your email address). Revolve Map: Copy the code from the bottom of the page once you’ve configured your globe. Below is an example of copying the code using the Feedjit code (note: Feedjit is a service that has now closed). Highlight the code then right mouse click and select Copy. 3. Drag a text widget into your desired sidebar. 4. Click on the Text tab in the Text widget. 5. Paste the embed code into the text widget. 7. You should now see the widget in your sidebar. Did we miss your favorite visitor tracking widget? What else did you want to know about visitor tracking widgets? What are your tips for using visitor tracking widgets? Leave a comment below to share your tips or ask a question. Hi there, I think it can only track visitors from the time you install the tracker? Is this what you mean? Hi Susan. I bumped into (as you do on the net) your site as I’m looking for a live traffic ‘counter’ that, importantly for me, displays the same info in the same way that Feedjit did, before it shut down. It had just the right ‘feel’ for my site and I’m struggling to find a suitable replacement. It’s frustrating when a service that works well for you closes down! Another reader suggested http://livetrafficfeed.com/ but it doesn’t appear to be working for me now either. Let’s know if you find any other good replacements! Thank you for letting us know, Mary! My preference goes to ClustrMaps (Globe Beta). It works very well w/ Firefox. With Chrome, the location is not slighty right. With IE11, half of globe countries are not show. Feedjit will not work now with the new https. I am assuming neither will the rest of these now. As far as I know, the others should work. Could you try adding the https to the URL in the embed code for Feedjit? Maybe that will work?